These Fairy Wand Cookies I designed and made for my daughter's 6th birthday were inspired by the Funky Fairy cake I recently made at the Debbie Brown workshop. I thought that a smaller and simplified version would look amazing on some wand cookies. The cookies were loved by all, and because all the little girls had already had enough to eat at the high tea, I wrapped them in plastic cello bags with a ribbon to take home. They looked sooo cute. For display at the dessert table I popped them into these mini tin planter like things I got from The Reject Shop (local thift store) for $3, stuck a couple of weights in the bottom (the type you tie balloons to for center pieces), some floral foam and some shredded wood. 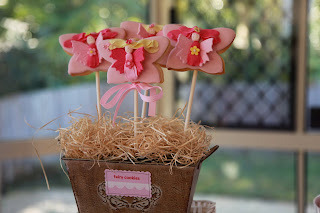 Viola stylish cookie pop stands. Special cookie sticks which are food safe and ok for baking in ovens are available through specialty baking stores and cake decorating shops. Not just cookies, fairy wand cookies are for playing make believe games with as well. Make fairies first to allow to dry/set. 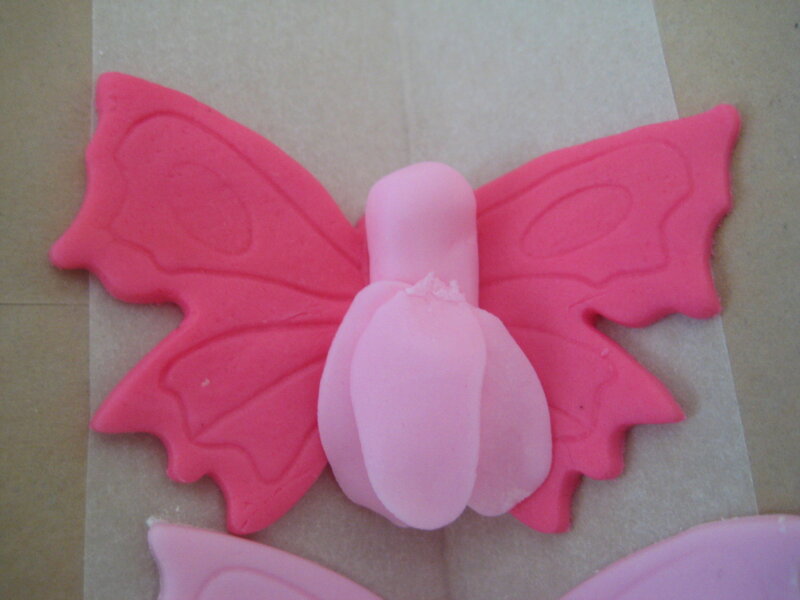 Colour rolled fondant dark pink (or whatever colour you would like the wings to be). Roll out fondant and using a large PME Butterfly plunger cut out butterfly shapes from rolled fondant, press the plunger down to indent the pattern and then plunge a final time to remove the fondant from cutter. 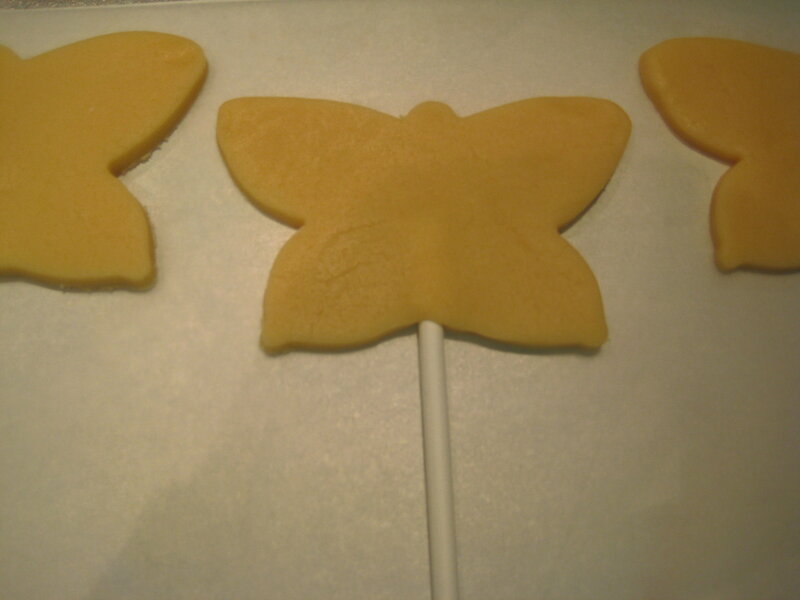 Pop the cut butterfly onto cardboard folded to a W with a little baking / parchment paper to stop them from sticking. Colour some more rolled fondant another colour, such as light pink and make fairy bodies by shaping into a log and then indenting the waist, flatten the bottom a little. 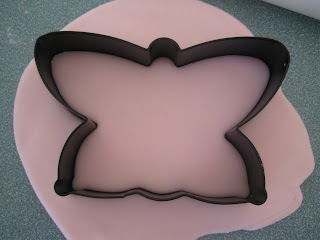 To make a fairy petal skirt, flatten small pea sized amounts of fondant with a small rolling pin and attach to the body. I used three petals for each skirt. smooth the petals into the body and attach a small blossom at the waist which will cover any joins. 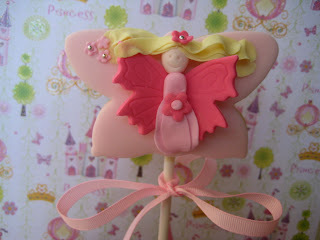 Attach fairy body to wings a little edible glue. 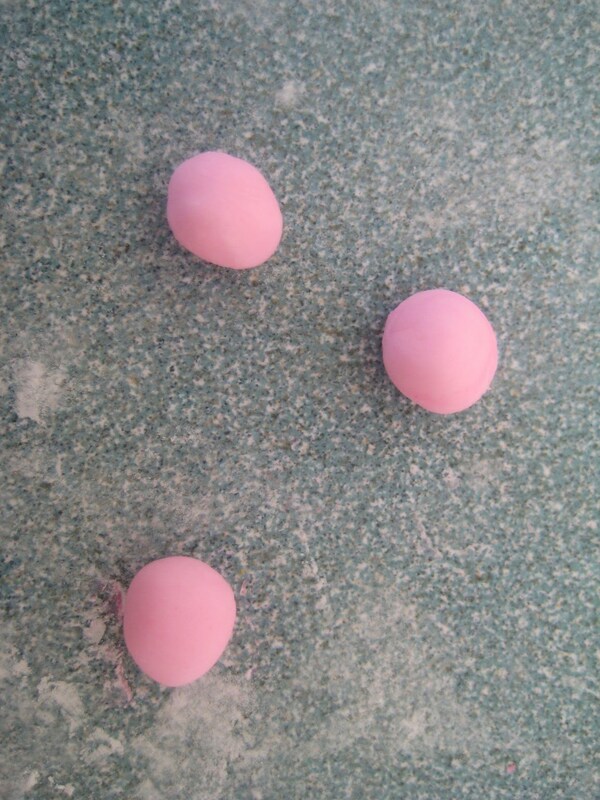 Colour fondant skin colour and make small balls for head. 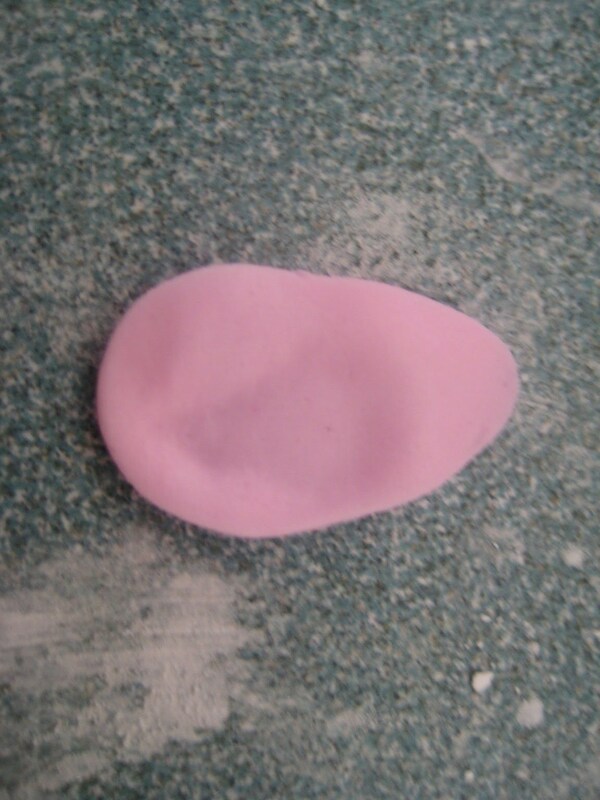 Flatten the face a little and shape the chin and then attach to the fairy body with a small amount of edible glue.Using a toothpick or suitable modeling tool imprint some eyes, and then using the edge of a large round metal piping tip add a smiley mouth. Allow the fairys to dry overnight. Place cookie on baking sheets and insert cookie stick. Bake at 180 C (350 F) for 10 to 15 mins until cookie is golden, allow to cool on tray and carefully lift onto wire rack. 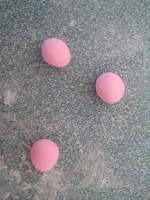 Make up a half batch of light pink marshmallow fondant. Click here for recipe. Roll out marshmallow fondant and using the same butterfly cookie cutter cut out butterfly shape. Attach to cooled cookie with a little water or edible glue. If required use a small rolling pin roll out to same shape as cookie (cookie may have spread a little larger during baking). 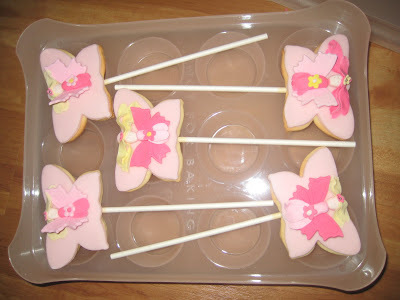 Attach fairy bodies to marshmallow fondant covered cookies using a little edible glue. Colour small amount of fondant light yellow. Flatten large pea size amounts of fondant using a small rolling pin. Same method as the skirt. 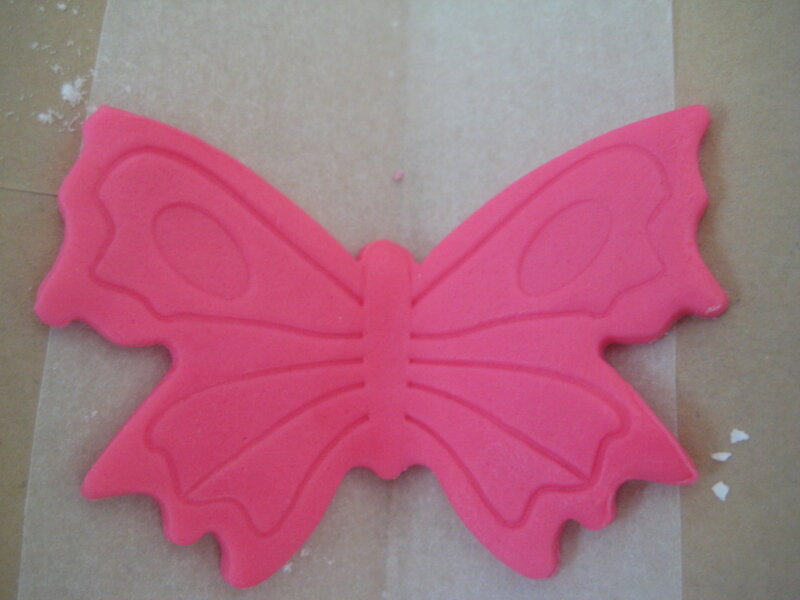 If you would like longer flowing hair use a little more fondant. 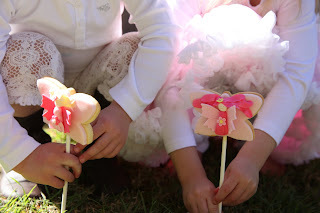 Attach hair to the cookies using edible glue shaping the hair into flowing waves. I added about 3 pieces on each side. Pop a small plunger flower at part. Allow to dry for a couple of hours before popping upright. Store in an airtight container, be careful not to knock off fairy wings or put to much pressure on the sticks. I used my Cupcake Courier - they are so versatile. 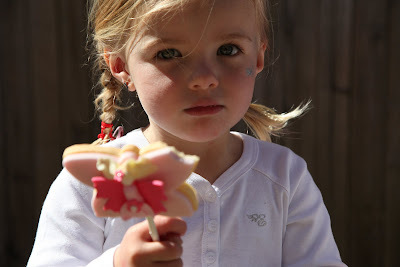 Cupcake Courier - not just for cupcakes, easily stores 15 fairy wand cookie pops in it's 3 levels. Using a mixer cream butter and sugar. Add egg and vanilla and mix well. Add the dry ingredients to butter mixture and mix until dough comes together. Wrap in plastic wrap and chill in fridge for 30 mins. I Love these they are Gorgeous! adorable treats for a beautiful girl! THANK YOU for the tutorial! These are ADORABLE! I am in awe of your talent. These are absolutely precious! you are so talented......they are just perfect, I bet all the other moms were green with envy!! will be a pleasure to follow your blog and try to do some typical recipe ^_^ ! So whimsical - and adorable to boot! hey... i've heard that fondant covered cookies are too sweet when bitten into because the cookie dough is thin. your thoughts?? I love, are precious biscuits. Absolutely Gorgeous. 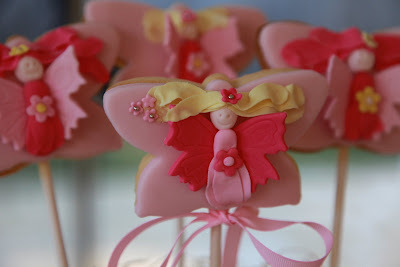 I think I might try them for my daughters first birthday party which is a tea party.